How do you know when your membership pin arrives in the mail? What is the tipoff that you are a little bit more obsessive compulsive about this band than your “normal friends?” They can honestly say they like the Grateful Dead, but you know it’s not that way *you* like the Grateful Dead, and you can prove it! When should you admit you have a problem? Well folks, there are some telltale signs that you have stepped a little over the edge. These examples are time tested over the last 40 plus years. See how many of them apply to you. If you find your head nodding up and down while reading the following points, you may officially be a tape obsessed Deadhead. 1. Grateful Dead lyrics flow from your brain to your lips to explain nearly everything around you. Have you noticed that a good handful of the non-show review posts on this blog use Dead lyrics in their title? It’s not that I’m trying to find cutesie ways to infuse my posts with Dead related themes. It’s because my brain thinks of these things as if they are thoroughly commonplace. Do you find the lyrics of Hunter or Barlow popping to mind to provide the perfect summation of a given event or person in your daily life? If the phrase “one man gathers what another man spills” has replaced the deeply ingrained human mantra “different strokes for different folks” in your brain, you are getting seriously Dead. 2. Does every day’s date remind you of a Grateful Dead show? It’s October 18th, as I write this post. Aren’t you thinking about 10/18/72?!?! Me too! Any time you write a check or date a paper or proposal; my God! – when you look at the calendar hanging in your kitchen! – Are you seeing Grateful Dead show dates everywhere?? Me too! Honestly, the first 31 minutes of nearly every hour of every day are really just there to remind you of a Dead show. It’s 9:03 right now. Remember that show from 09/03/80?? A Jim Wise recording as I recall. Oh look, now it’s 9:14. The Dead were touring Europe again in 1974. They were in Germany on 09/14, right? The Eyes of the World encore, right? Cool. It’s no wonder it becomes nearly impossible to pick something to listen to when staring at your tapes, CDs, or folder full of shows. 4. You’ve been given up on as a lost cause. Does your significant other, who isn’t really into the Dead, not even try understanding what this whole Dead trip thing your on is all about anymore? Has he/she come to offer up a well worn look of bewilderment when seeing you back at the computer doing your “Dead freak” thing. “Are you reading the GDLG, again!! !” If they’ve stopped trying to bring you back, or probe you for a reason why, it’s over. You membership pin just arrived in the mail. There are other telltale signs, I’m sure. But these above are some of the classics. Take comfort in the company of others like you, my friend. Welcome to the ever growing support group. We’re here to help - or to make sure you stay thoroughly beyond help, whichever the case may be. Hi, I'm US Blues and I've been a Dead Freak since 1978. And how did you know I was listening to 10.18.72 this morning? I wonder if being a deadhead also means to stop listening to all other music. That would be a cause for concern, or maybe I am not a real deadhead. This is frighteningly and hilariously accurate. I love this blog. ouch. Bad enough that every date reminds me of a show, but I'll spend five minutes standing and thinking "10/18/72 or 10/18/74?" and comparing Dark Stars before rushing off to work. 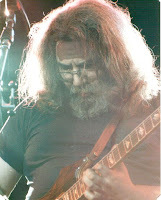 I am also guilty of making mental top 10 lists of increasingly obscure musical moments (best jams where Jerry plays slide, highest number of f-words spat in a show by Bobby or Brent, Dark Stars with the most distinct jams before the verse, etc). Ah, such a wonderful rabbit hole to have fallen down. and mauro, Weir said somewhere (or is widely misquoted as saying) that one thing that bothered him most about deadheads is how so many of them refused to listen to anything BUT the Dead. I think you're safe. Ah yes - Hunter/Barlow lines for everything! My colleagues and I clean up oil spills/hazardous waste so I've long wanted to make an official t-shirt with that line and a SYF with an oil slick behind the lightning bolt. But I don't think the guv'nor would approve! Sometimes we ride on your horses, sometimes we walk alone - A t for my wife's horse shows where I seldom ride. Mauro, you raise an interesting point. Back before I took a multi-year break from the Dead, they were indeed all I listened to for a number of years by a margin of probably more than 10 to 1. Right now, I can honestly say that I could never go back to "all Dead, all the time." I've really enjoyed getting back into the band's music this year, but the Dead probably only get about 30% of my ear-time now. I will intentionally put off reviewing shows because a lot of the time I enjoy listening to other music more than the Dead. I've got the all-dead all the time problem, (un)fortunately. My girlfriend has actually grown pretty sick of listening to them, begging me to put something else on seeing as it's all I play. I'm really not sure why I can't enjoy other music in the same way, and I genuinely hope that I can soon learn how to enjoy some other music the way i enjoy the Dead, but as it stands now (and for the past 3 or 4 years), there's really no other music that can encapsulate where my life is, where my thoughts are, and still constantly surprise me. I'll put on occasional bluegrass (Old and in the way - Jerry's early bluegrass group) or some good jazz to do some work, but beyond that, my ear has been claimed so to speak by whole Grateful Dead experience, from beginning to end.